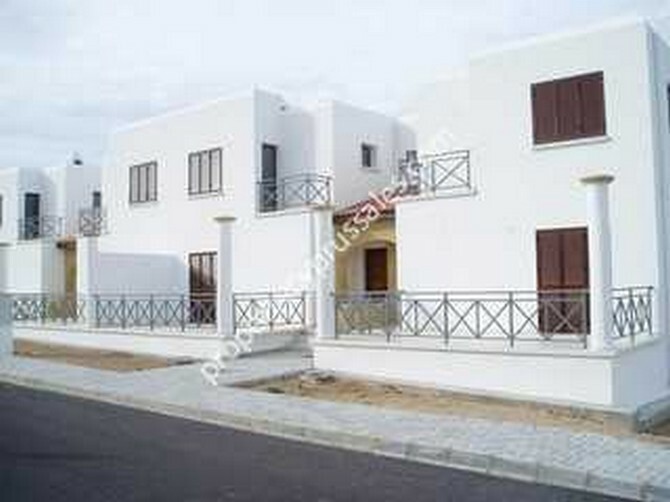 3 bedroom spacious sea-front luxury semi-detached villa in Cyprus Tatlisu for nature lovers and tranquility seekers. The villa commands majestic views of the North Cypriot coastline and the five-finger mountains. Sea View Holiday Villas in TatlisuPricesType 1 - 3 bedroom GBP 60,000Type 2 - 3 bedroom GBP80,000Type 3 - 3 bedroom GBP90,000Type 4 - 3 bedroom (Front Sea View) GBP120,000Type 4 - 3 bedroom (Back Sea View) GBP110,000The development of the North coast of Cyprus has, until now, focused on the town of Kyrenia and surrounding mountains and coastline. Esentepe, 20kms to the East of Kyrenia sits at the foot of the hills covered in mature pine forest, above the coves and inlets yet is within 30mins of Famagusta and 20mins from Kyrenia. This unique village of town houses and villas will blend in with the island architecture but provide modern amenities that a discerning buyer will require in this beautiful unspoiled Mediterranean setting. Right on the coast overlooking the sea, the homes will have views the whole length of the North coast with the crusader castles of Kantara and Buffavento looking down from the mountains. Type 1:The total area of Tatlisu Village Villa type 1 is 143 m2. These terrace houses have 3 bedrooms and 1 bathroom, a downstairs cloakroom with a large living room/dining room.Type 2:The total area of Tatlisu Village Villa type 2 is 154m2. These detached houses have 3 bedrooms and 2 bathrooms with a large living room / dining room and a separate study.Type 3:The total area of Tatlisu Village Villas of type 3 is 188.26m2. These detached houses have 2 bedrooms and 2 bathrooms upstairs with a large living room / dining room and study bedroom 3 downstairs. Type 4:These are the most prestigious houses and the village development, being located with direct frontage to the sea. 3 bedroom spacious sea-front luxury semi-detached villa in Cyprus Tatlisu for nature lovers and tranquility seekers. The villa commands majestic views of the North Cypriot coastline and the five-finger mountains. The development of the North coast of Cyprus has, until now, focused on the town of Kyrenia and surrounding mountains and coastline. Esentepe, 20kms to the East of Kyrenia sits at the foot of the hills covered in mature pine forest, above the coves and inlets yet is within 30mins of Famagusta and 20mins from Kyrenia. This unique village of town houses and villas will blend in with the island architecture but provide modern amenities that a discerning buyer will require in this beautiful unspoiled Mediterranean setting. Right on the coast overlooking the sea, the homes will have views the whole length of the North coast with the crusader castles of Kantara and Buffavento looking down from the mountains. The total area of Tatlisu Village Villa type 1 is 143 m2. These terrace houses have 3 bedrooms and 1 bathroom, a downstairs cloakroom with a large living room/dining room. The total area of Tatlisu Village Villa type 2 is 154m2. These detached houses have 3 bedrooms and 2 bathrooms with a large living room / dining room and a separate study. The total area of Tatlisu Village Villas of type 3 is 188.26m2. These detached houses have 2 bedrooms and 2 bathrooms upstairs with a large living room / dining room and study bedroom 3 downstairs. These are the most prestigious houses and the village development, being located with direct frontage to the sea.